Hello again! As you will be aware if you have glanced through our web site, we get involved in all sorts of damp proofing and use all sorts of materials to treat the various problems we come across. We speak to people all over the country and it is fair to say that the existence of most of the membranes we use is still not widely known. The broad perception of damp proofing is still that you get your walls injected and that's it! For some applications injection and waterproof render, or one of our new damp resistant plasters, is still the weapon of choice of course. We normally install Dryzone Dryrods these days as they get exactly the right amount of product into the wall. Also, when tanking a basement or any wall built into a bank the Vandex slurry systems we install can be ideal but there is a suite of materials that can cover both of these functions when conditions are right. 3) Environmental note: In addition to its damp proofing properties, the membrane creates a small air gap, due to its profiled shape; this improves the U-Value of the wall. If unventilated, the air gap is not big enough to allow convection and so is an effective reducer of heat loss (double glazing works in a similar way). This coupled with plasterboard fitted using the 'dot and dab' method (if appropriate) gives two cavities in an otherwise solid wall which is beneficial in two ways. Firstly the cavities create a thermal barrier, as stated, which helps with the energy efficiency of the building. Secondly, because the surface of the wall is not cold due to this cushion of air, this greatly combats condensation which is of course a major cause of the more obvious signs of dampness such as mould and smells; Even without secondary insulation the membrane system will help to make the building more 'energy efficient' and take away the cold clamminess to the exterior walls making them feel warmer to the touch. This coupled with the eradication of damp and associated smells in the atmosphere all helps to make a healthier, more comfortable environment. Oldroyd membranes are made of 70% recycled material and are recyclable again at the end of their intended life-spans (more than 50 years expected). 4) The Oldroyd membrane system is resistant to sulphate attack so all internal finishes will be fully protected from hydroscopic salts for decades. 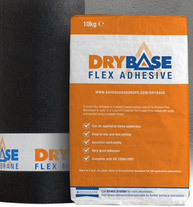 7) Membranes are flexible and will not crack or leak during the seasonal movement usually found in old buildings. If a traditional, waterproof render cracks water will find a way through to the plaster again and cause dampness issues. We hope this information helps and may offer more options to curing difficult damp related problems. For more information see our damp proofing section.